VMUG UK User Conference 2014 – a Rimmary, including pictures! 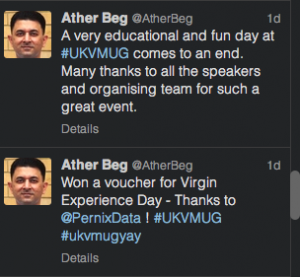 Being on the UK VMUG committee is a tad similar to organizing a party – you hope that all your guests enjoy it but you’re a little on edge and don’t fully enjoy it yourself and you breathe a sigh of relief when it’s all over! 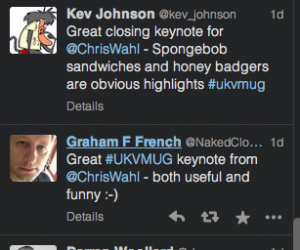 But I couldn’t be more thrilled with how this year’s UK VMUG turned out – especially when reading all the tweets about what a great day it was, great speakers, sponsors, tracks, content, etc. etc., that makes it all worthwhile! This year’s proceedings started with our usual tradition of vCurry and vQuiz the night before. 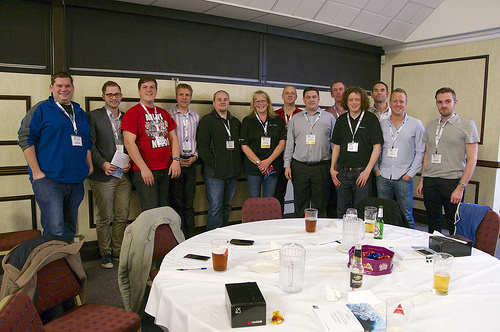 This year vCloud Air sponsored it, so it enabled us to open up to all the community, including the sponsors. 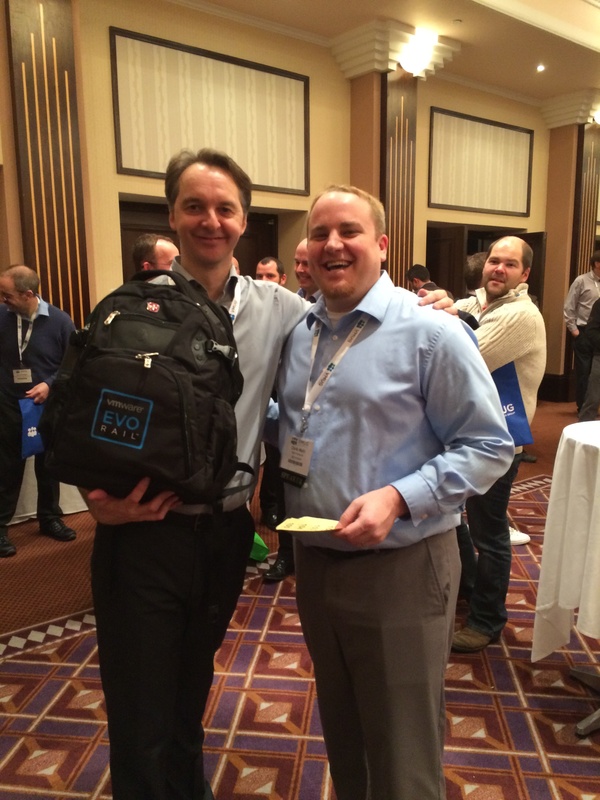 Mike Laverick also announced his EVO:RAIL swag bag raffle. Every year Mike raffles a bag containing goodies from VMworld. This year the bag was not a VMworld bag and it contained many EVO:RAIL specific goodies, as well as pre-launch PROJECT MARVIN swag! 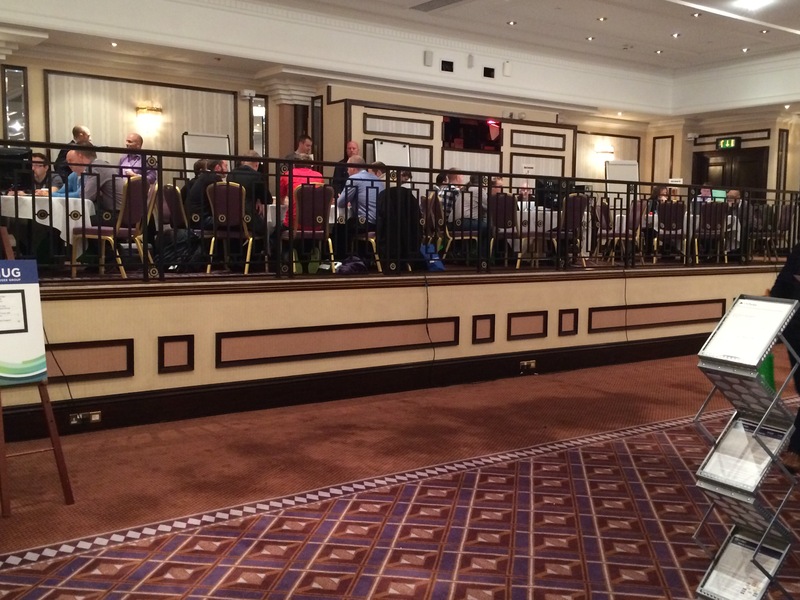 This year Mike collected for a great charity, National Association of Blood Bikes, and raised over £400! 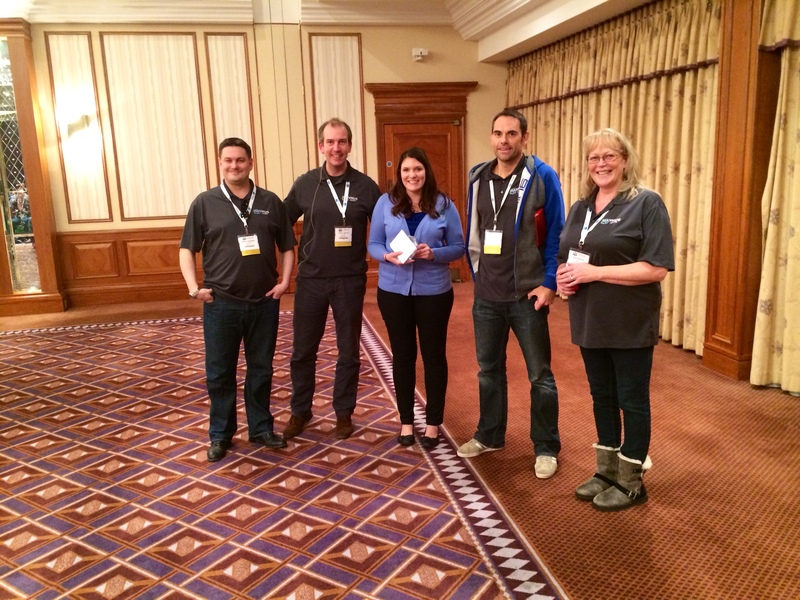 And the winner was our guest speaker, Chris Wahl! As always, we were very lucky to have Joe Baguley, EMEA CTO, VMware, as our opening keynote on the day. Joe has the ability to be informative, entertaining and deep dive technically if required. His support of VMUG is a great testament to the uniqueness of VMware as a company supporting its affiliated user group that I’ve not seen in any other software company that I’ve worked with and/or for. My key take away from Joe’s keynote was his point about “Infrastructure as Code”, the next evolution for IT in moving toward the Software Defined Datacentre. 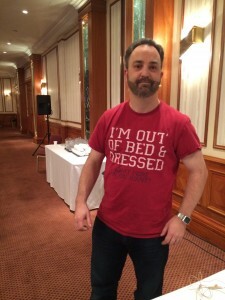 Loved Joe’s shirt he was wearing too! We were very fortunate to have an abundance of sponsors this year – 34 in total – including VMware, naturally, as our program partner. 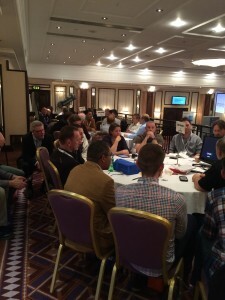 We are also very lucky as a committee to have Martyn Storey as our VMware representative; Martyn contributes a lot to both UK VMUG and London VMUG and helps us in many ways, such as securing VMware speakers and attending every meeting and user conference that we hold. 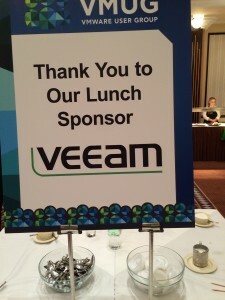 Veeam is also a great supporter of VMUG globally and have consistently supported the UK VMUG and this year were again our platinum sponsor AND sponsored lunch, hence why it was so much better than last year. The mezzanine, Simon Gallagher’s brainchild, was a roaring success this year, primarily due to the awesome community members staffing it, but also because we added it to the main agenda 🙂 We were delighted to have Chris and Tim from VMware GSS, who discussed anything and everything with attendees, ranging from ESX failure to boot from USB, to query on existing SRs to licensing expiry and renewals! Mike Laverick and Lee Dilwlorth’s DR session was soooo popular they had to vacate the mezzanine area and re-convene in the room where the food and drinks were served! 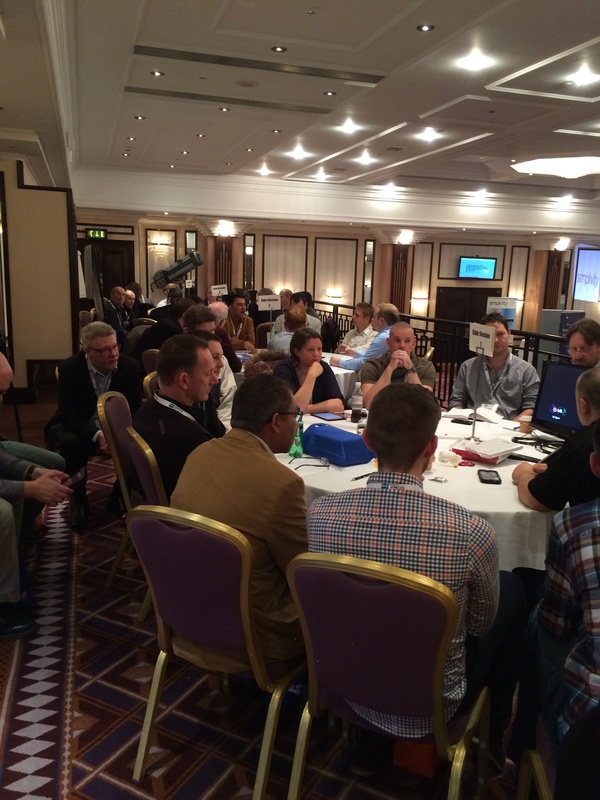 We also had VMware UKs PR agency on hand, conducting interviews with key speakers and attending members. 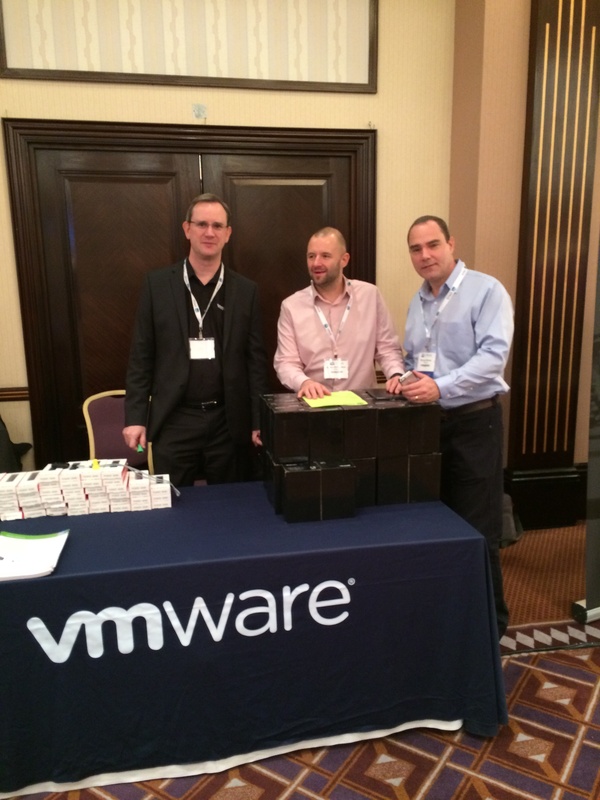 Look out for these by following @VMware_UK on Twitter! We also had all the sessions in the Britannia Suite (where the keynotes were held) recorded, and these will be uploaded to YouTube soon, so follow @UKVMUG on Twitter for further details as they become available. Our guest community speaker, Chris Wahl, was our closing keynote speaker – having conducted a breakout on NSX as well as being on the community mezzanine – and gave a thought provoking, entertaining presentation that was greatly appreciated by our members. His assimilation into the UK is, perhaps, summed up best by the tweet below!! Alaric then announced a very special initiative, vFACTORLONDON! We are encouraging submissions from end-user, first time speakers to submit a 10 minute lightning talk for our January 22nd 2015 meeting. We’ll assist with providing a mentor through the excellent #FeedForward initiative created by Mike Laverick and others in the community, details of which can be found here. 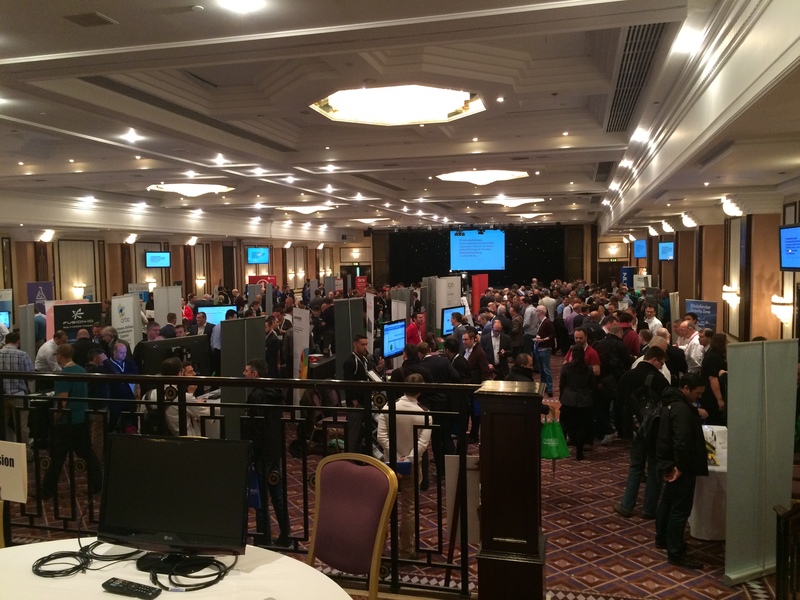 To encourage you even further to submit a session, which you can do here, we’ll be giving away some amazing prizes to successful presenters, including a MacBook Air, iPad Mini, iPad Air and Amazon vouchers – what are you waiting for? Submit now! 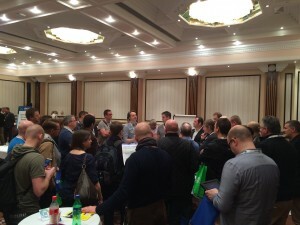 As always, we’ll post presentations we have to box.com/londonug and VMUG HQ will also upload them to vmug.com – details will be announced on Twitter, so make sure you’re following #UKVMUG hashtag! Finally, a thank you to everyone involved in making this event such a success; the sponsors, the speakers, the community but especially to my fellow committee chappies, Stu, Si and Al and also the amazing team from VMUG HQ, Emily, Maria and Scott – just goes to prove that as a team you can achieve anything! It was very kind of Emily to acknowledge us as a committee, thanking us on behalf of VMUG. 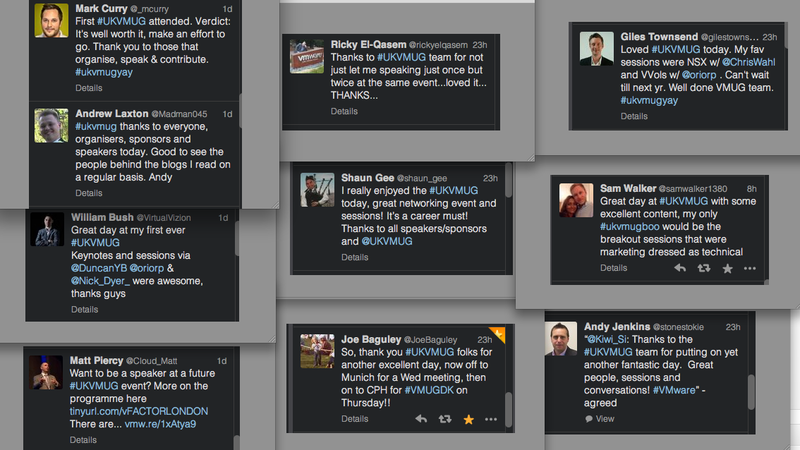 Oh, and don’t forget to put November 19th 2015 in your diary as a placeholder for next year’s event! 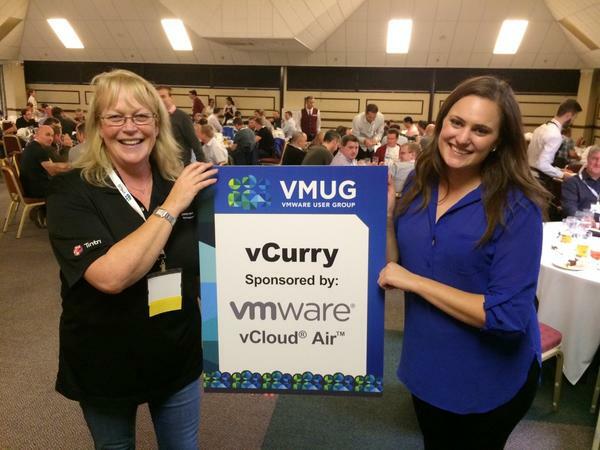 This entry was posted in Virtualization, VMUG and tagged Alaric Davies, Chris Wahl, EVO:RAIL, Joe Baguley, Lee Dilworth, Mike Laverick, PernixData, Simon Gallagher, Stuart Thompson, UKVMUG, vCloud Air, Veeam, VMware by Jane Rimmer. Bookmark the permalink. A Rimmery indeed! Looks like another great event, shame to have missed this one but ‘this time next year Rodney we’ll be there !